We get our Christmas tree at the beginning of December, enjoy it until the holiday season has passed and then put it out to be recycled. 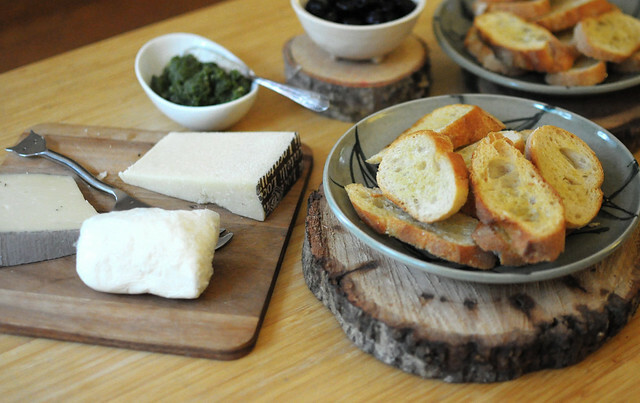 It’s a little sad to see the tree go, so I’ve found some ways to savor the rustic piney goodness all year long by upcycling parts of our tree. 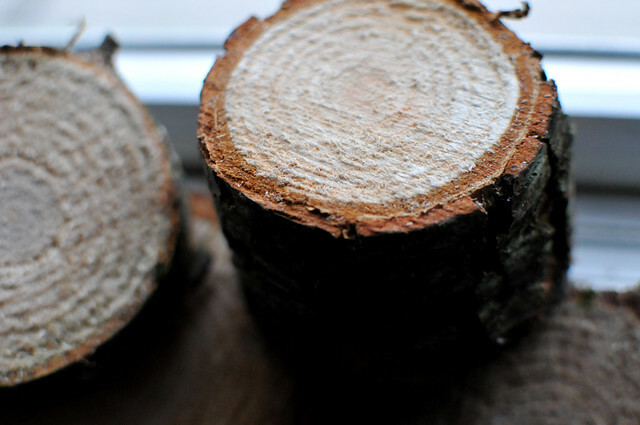 Every tree gets a clean trim along its stump when you buy it at the lot. And thin or thick, those slices make primo crafting supplies. I picked up an arm full of discarded slices after we bought our tree last week. They are free for the taking and the lot owners told me they will just burn whatever is left. This one’s fate was a candle holder. I used a 1 1/2 inch spade bit to drill a hole in the middle. 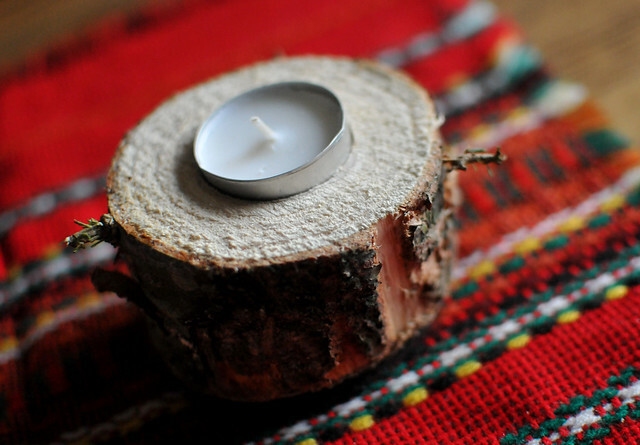 And then snugly fit in a tea light. The cut was clean so I didn’t need to sand it and I wanted to keep it rustic. It’s still a little sappy but the fresh pine scent is divine. 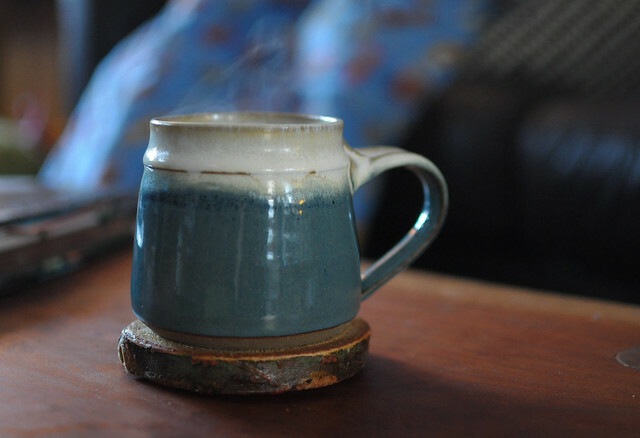 I will be making more — they make great gifts too! I still have a bunch of other stumps and slices from last year. 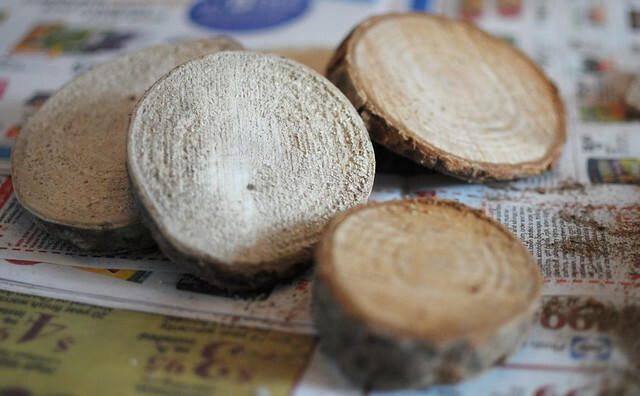 They are sappy when fresh, but after a week or so, the sap will dry out and you can paint, varnish or leave au naturel. 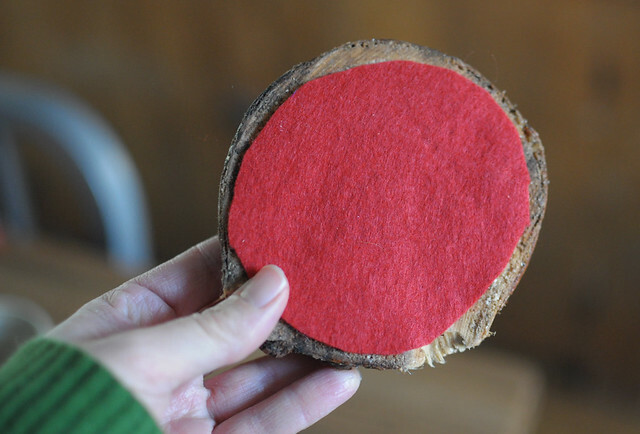 Last year, I made a bunch of coasters with the thin evenly sliced stumps. For a more finished look, I sanded them, applied a protective coat of polyurethane and glued felt to the bottom. 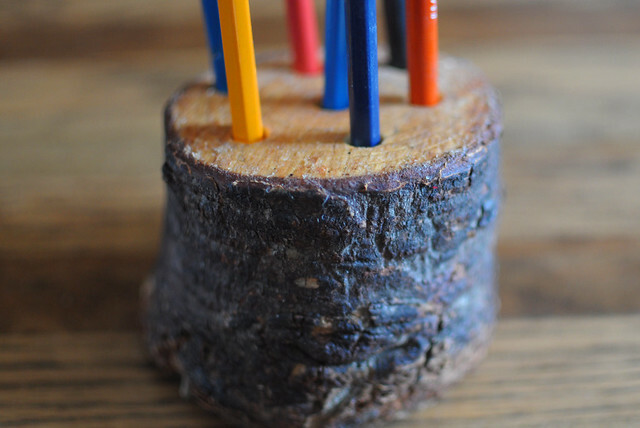 I also made a pencil holder with a thicker slice and gave it to my son. 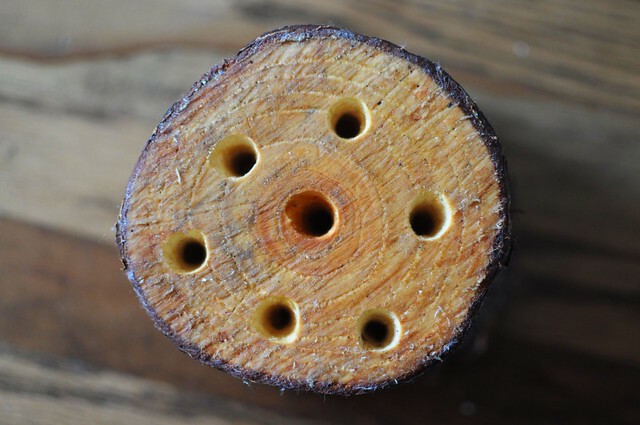 I sanded around the holes and applied a coat of beeswax. If you don’t make it to the Christmas tree lot in time for the castaway stumps, you can slice up your own tree before you put it out to be recycled. 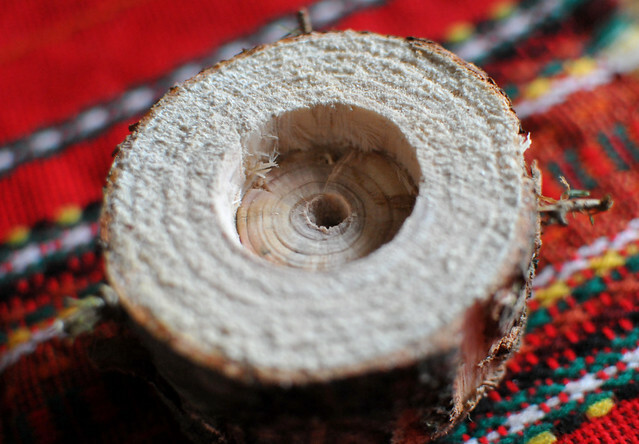 That’s what my brother did when I asked him for a few cuts from his tree, which is much larger than the one we put in our house. 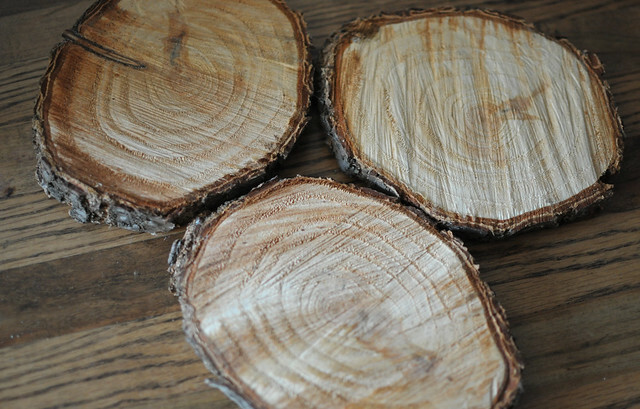 These I kept natural and use as trivets and serving pieces. I’ll be slicing up my tree before it hits the curb. Leslie used a wood burning tool to personalize some wood slices for an engagement gift for a friend. I’ve also seen painted slices used as wall decor and ornaments, perhaps my next project for the rest of the uneven scraps. Have you upcycled parts of your tree? I love these! I’ve always loved wood with the bark left on. My ex-husband cabinetmaker made a wonderful table from such wood… with carved legs (simple, modern, hooved) all moving in the same direction. We both loved George Nakashima’s furniture back when my then-husband made it. (I still do.) Your circles remind me of the circles cut from my fence to make room for the wine-bottle bottoms we put in the fence. We attached the leftover fence wood circles behind the Peace-Joy sign (from your Boo sign idea) between the sign board and the fence to hold out the sign and make room for the mini-lights between the board and the fence. So we recycled, too Thanks for these great ideas of yours! Thanks Renee — glad you liked them! I just saw some more ideas for the slices including photo ornaments and a garland. I might have to stock up on more slices. I walked by the poetry fence the other day and the peace-joy sign looks even better in person. I love that you have it turned on during the day too.